Marginal Media has served clients in the performing arts, consulting, publishing, communications, manufacturing, public relations, and a range of other industries. See the Community page for our work with non-profit and community organizations. Atlanta healthcare start-up Partners Healthcare Group needed to get up and running with a branding/identity package including logo, business papers, and a Web site. Solutions: Marginal Media designed a corporate identity for Partners Healthcare Group that looks clean, strong, and trustworthy. The accompanying Web site is elegant, simple, and direct, setting up a great framework for future expansion as this young company grows. Legendary performing artist Patti LuPone wanted an official Web site to promote her award-winning career in theatre, music, film, and television. As a busy performer who spends a lot of time on the road, Ms. LuPone requires her site to be maintained without having to personally deal with technology issues. 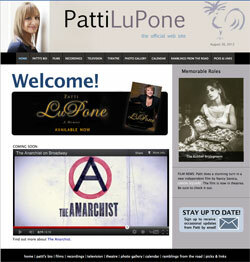 Solutions: For more than 10 years, Marginal Media has provided Patti LuPone with comprehensive online services including design and maintainance of the pattilupone.com Web site, online promotions, Web and e-mail hosting, and consulting on technology solutions to help Ms. LuPone keep up to date when she's out touring. The Official Web site of Patti LuPone features an appearances calendar with upcoming show and ticket information, the witty monthly "Ramblings From the Road" message to fans, a current biography, photo gallery, discography, and more. The Web site for Montclair State University's innovative and cutting-edge arts series Peak Performances was in need of an overhaul. Developed as a Ruby on Rails application running a MySQL database, the site also needed some code and data clean-up. 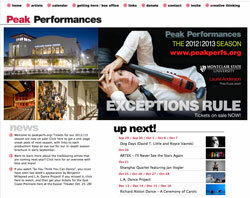 Solutions: Marginal Media brought the Peak Performances site up to date, adding event and artist photos and information for over three dozen professional and student music, dance, and theatre productions. We refreshed the graphics, and updated the site's integrated calendar and ticketing system. We also set up a new Rails test/sandbox development server where the MSU staff could preview and work on upcoming site features "behind the scenes" before porting them over to the live Web site. 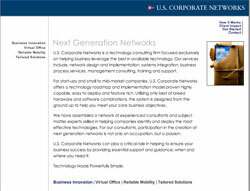 U.S. Corporate Networks is a technology consulting firm focused exclusively on helping business leverage the best in available technology. Services include, network design and implementation, systems integration, business process services, management consulting, training and support. Solutions: Marginal Media has provided U.S. Corporate Networks with online and graphic design, and Web technology consulting. Fulcrum Ventures is an Atlanta-based private equity firm focused on providing expansion capital to rapidly growing companies. Fulcrum provides financing to meet a wide range of needs, including internal growth initiatives, acquisitions, management buy-outs, and recapitalizations. 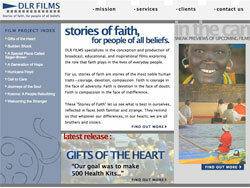 Solutions: Marginal Media has provided Fulcrum Ventures with Web technology consulting and digital asset conversion. DLR Films specializes in the conception and production of broadcast, educational, and inspirational films exploring the role that faith plays in the lives of everyday people. Solutions: Marginal Media has provided DLR films with digital media conversion, online and graphic design, and Web and e-mail hosting.